Twitter silently launched a new feature on their website that suggests friends you may want to follow based on an unknown algorithm under the “Find People” tab. The micro-blogging service has been adding a lot of features lately, as its popularity seems to grow everyday with the amount of new apps coming out to constantly support it. A few of the features I’d like to see Twitter implement aren’t big requests, but some simple things to make the site a bit more user-friendly. 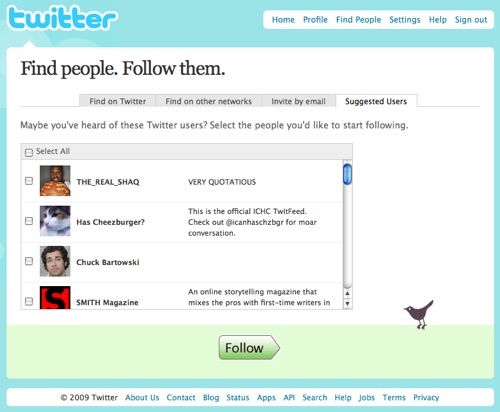 Remember the early days of Twiter when the site would overload whenever you did anything? They’ve fixed that little problem it seems, and as the site continues to grow I’m sure more neat features and options will be added. But they’re suggesting the same people to both of us. I’d like them to suggest based on keywords I’ve tweeted…. :/ Or allow me to put in a keyword, THEN suggest people based on the keyword…? I did choose to follow LiveEarth from their list….but that’s the only thing I saw — aside from perhaps Wil Wheaton — that would be up my alley….